Welcome to our home owner’s guide of the various garage flooring options and ideas that are available today. This is a good starting point if you are not sure about which type of flooring would be best for you and your garage. Here, you can get a brief description as well as some of the benefits of each flooring option. 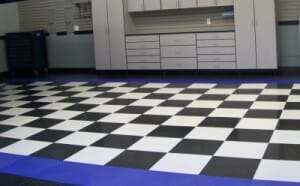 One of the leading favorites is garage floor epoxy. Mixed with an A and B compound, this tough resinous coating is usually applied in multiple coats. You have the option of a solid color or adding a mixture of colored chips to create a bit of texture as well as different color hues. 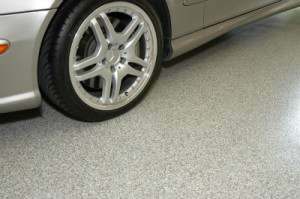 Warranties of 15 years or more is not unheard of anymore for these tough garage floor coatings. Epoxy coatings are what you typically see in car showrooms, restaurant kitchens, warehouses, and many professional garages. It has great durability, is easy to keep clean, and it resists all types of harsh chemicals that can drip from your car onto the surface of the floor. They are available in a variety of finishes that can create a nice glossy finish and shine that will completely change the looks of your garage. New materials such as quartz, custom blends of color chips and fast curing polyaspartic coatings that enable you to use your garage the next day are becoming newly popular as well. Other garage flooring ideas to consider that are the new hot trend is garage floor tiles. They are available in a variety of materials and colors from interlocking hard plastic tiles, vinyl composite tile, peel and stick vinyl, and even porcelain tile. Some of these systems can be installed by the average homeowner in as little as a few hours, while others will require some skill or need to be installed by a professional. The fascinating feature of a tiled garage is that you can color coordinate the design and look of your garage from retro checkered to something a little more luxurious. All of these tiled garage floor options are designed to not only make your floor look nice, but to protect it from the elements of a working garage as well. They offer various levels of resistance to oils, chemicals, stains, and impacts. They are also designed to be easy to clean and to provide an anti-slip surface. And you will find that no matter what area of the country that you live in, these custom garage floors will provide you with years of protection. If you want an option for your garage floor that is easy and convenient, then the rubberized vinyl garage floor mats are an option worth considering. This vinyl garage flooring is available in different colors and textures as well. It can be as simple as a mat large enough to pull your car onto to keep the concrete free from oil and contaminants or you can do the whole floor. In addition, some have the added advantage of cushioning for anti-fatigue, they are easy to install and the simplest method for hiding concrete pitting and cracks. Best of all, some of these can be rolled up and taken with you if you move. 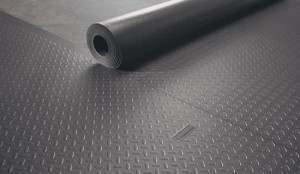 There are also specialty mats and can provide for great flooring ideas. They offer benefits such as lighting, helping to park your car in the same spot every time, or containing liquids from your car from rain, snow melt and ice. They are truly one of the easiest garage flooring solutions on the market. Then the old standby that is still popular is painting your garage floor. This traditionally is one of the oldest and least expensive ways of enhancing the looks of your concrete. Water based latex is the easiest to apply or you can upgrade to a 1-Part epoxy paint that adds durability and chemical resistance. While not the most permanent way to cover your floor, it is definitely a garage flooring option that gives you a large selection of colors to choose from. 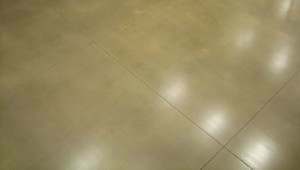 For those who like the idea of the more natural look of concrete, a garage floor sealer may be all that is needed. A good sealer will prevent concrete floor dusting, resist water, and provide some mode of protection from oils and chemicals. It will also protect the concrete from road salt, dirt, and help to resist stains. They also make for much easier clean up. Like garage floor paint, sealers can be one of the least expensive ways to protect your floor and are easy to apply. If you want something tougher, a clear epoxy coat is a great idea that will provide maximum protection for your floor. If you like the idea of turning part of garage in a workout area, we discuss some of the best gym flooring options that you can use in a garage. From rubber flooring to foam mats, there are many options to choose from based on the type of exercise you want to perform. As you can see, there are plenty of flooring ideas for your garage to choose from. Take the time to evaluate what you think is best for you and your budget and determine if you want to do it yourself or hire someone to do it for you. Heck, maybe you just need a little information to convince your spouse of the benefits of nice garage flooring, besides the fact that it looks awesome! 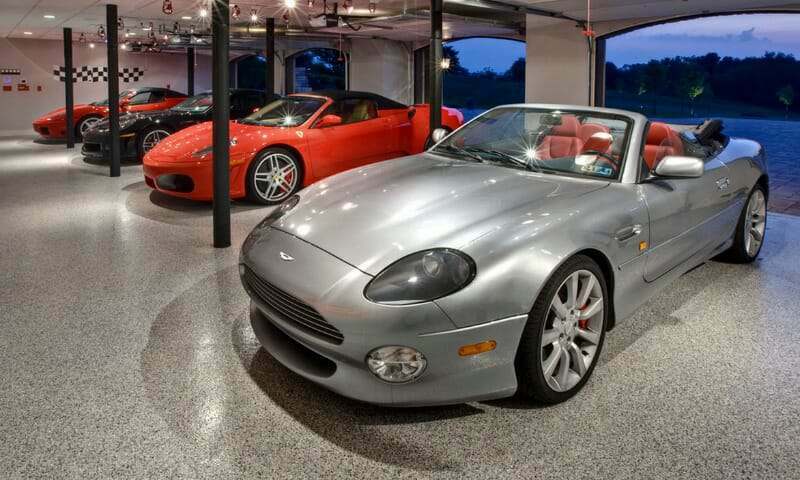 If you want a better idea of how some of these garage floor options look you can visit our garage flooring gallery. Whatever your reason may be, we hope that you find the best garage flooring ideas for you. Please enjoy and use our site to your full advantage. It’s nice to see someone recommending porcelain tile. I had it in my last garage and loved it. Great site by the way. When you said, “Then the old standby that is still popular is painting your garage floor. This traditionally is one of the oldest and least expensive ways of enhancing the looks of your concrete. ” I’d be careful with paint… So many people have had terrible results – and it makes it harder to epoxy after the fact. I read an article that talks about that. Hello Tim and thanks for stopping by. Yes, I agree that it does make the job more difficult to prep the floor properly if you are going to epoxy a garage floor that has been painted. As hard as it is to believe however, there are many people who still paint their garage floor with a concrete paint because it’s just plain inexpensive and easier to do, regardless of how long it will last or perform. Just ask the paint department at your local home improvement center. I did and it is the reason that this “old standby” is included in the article. Excellent article on flooring options for the garage. I like to see articles like this that inform homeowners of options and educate them. Thanks for the kudos John. I didn’t realize that there are so many options available for garage floors. It’s good to know that I can choose from a wide variety of stains and coatings after I have my concrete floor installed in my garage. I personally like the idea of having a natural looking concrete floor, so I thought that you made a very good point by recommending simply getting my garaged floor sealed to protect it from oil and chemicals that may drip on my floor. The information you shared here are really informative. I have done the epoxy coating for my garage as it is easy to maintain. It has a gleaming finish that looks really attractive. Many of my friends appreciated me for this concrete epoxy coating work. Awesome information on this site. I saw some discussion about moisture emmissions rate and the problems with some floor coatings, but I was hoping for more details. I have a high moisture emission rate in the back of my garage >5 lbs /1000sf / 24hrs and about 4 in other locations. This is creating a High humidity level in garage (70% in the back corner). What type of garage floor coating would be best to combat the moisture emission rate and hopefully reduce the humidity level? Hello Brian. If you want to apply an epoxy coating to your garage floor then you will want to use a moisture vapor barrier epoxy primer as your first coat. These are special primers that block up to 20 lb/24hr/1000 ft2. You can then apply a colored base coat over that and build your epoxy system from there. Legacy Industrial carries such a primer and you can find it here. It’s also a good idea to determine the source of the moisture in order to help prevent further issues, unless it’s a case of having a below grade slab in a wetter climate or something similar. I remain concerned that hot tires could damage the new epoxy seal. Do you have any ideas regarding mats or tiles I might consider laying on top of the epoxy where the tires rest to prevent this? Is this even a real risk? Hello TJ, if you used Epoxy-Seal garage floor paint then yes, you will get hot tire lift at some point. If you want a mat, then any garage floor mat will work just fine without damaging the paint. Tiles don’t always work unless you want an interlocking tile mat. Individual tiles have a tendency to move every time you park your car. Great site, thank you. My garage floor is several years old but has no cracks or oil stains. Should I be able to get by with etching instead of grinding for the proper result? I can rent a grinder if needed, just don’t know that it is necessary. Hello Oli. Yes, in most cases you can get by with a good acid etch. Just be sure to consult with the manufacturer first before you make a purchase. Very informative, love the information! I used an epoxy garage floor paint about 13 years ago. It required a acid wash prior to painting. I wondered if this damages the cement. I have some damage on the foundation wall near the garage door and maybe some pitting out on the driveway. Cons: the floor is slippery when it has snow or water on it. Even with the specks added to the paint to prevent slipping. Pros: cleaning of the floor like when my older car is parked in the garage and it drips oil. There are spots where the paint was peeled up after sticking to the tires but generally the paint is in decent condition. Hello Jack. An acid wash will not damage the concrete, but it does open up the pores. The pitting on the driveway is most likely from freeze thaw damage or road salts if you get snow. A penetrating sealer like this here would help to protect the concrete. Yes, epoxy can be slippery when wet. Contrary to what some believe, the color flakes do not provide a non-slip surface. They are for aesthetics only. If you want to create a better non-slip surface, we would recommend adding a good clear coat with the addition of an anti-slip additive. It would require roughing up the surface of the epoxy with 150 grit sandpaper before application. You may lose some color flakes in the process, but it will clean up the finish of the color coat and then the clear coat will make the floor look almost brand new again. Great article, I’m a weekend hobby mechanic mainly working on my own fleet of performance cars and motorcycles. Considering a Crack-X garage floor system in my 3 car garage with car and bike lifts. Following inspection of the floor they are specifying, grind the existing concrete floor, fill the control joints with rubber type product, a base coat, color flakes, broom off residual, and two “Graniseal” top coats. It’s not an epoxy but Crack-X says it better and warranty the installation. Are you aware of their product and performance. Photos look good but will it hold up and preform? Hi Paul. We visited the Crack-X website to try and get more information about the products they use. Unfortunately, they use generalized terms in regards to their coatings and do not specify exactly what it is they use. They do not provide any technical data sheets on their website as well. “Graniseal” is a not a specific coating product. It’s a made up marketing term for their coating process. I’m not saying this is a good or bad thing, there just isn’t any information available to help determine what you would be purchasing. We are always a bit suspicious of companies that use vague terminology and do not provide information for comparison purposes, however, they may have good product and just bad website marketing. We suggest contacting them and asking for the data sheet info so that you know exactly what would be applied to your floor. If they hesitate to provide such information, we would suggest looking elsewhere for your coating needs. We have an article on how to choose a floor coating contractor that you may want to read. I applied floor paint onto a well established but bare concrete domestic garage floor many years ago. The paint peeled off within a year and is now patchy with bare concrete showing through in many places though the rest seems to have bonded. I want to make a better job this time round and was very interested in your advice. You mention that it would be difficult to get good results over old paint which are my circumstances so any advice? I doubt the remaining paint would come off as it has been down over fifteen years and seems to be permanent if very faded. Your best bet is to grind the garage floor, Russ. This will remove the old paint and prep the concrete for a proper coating (instead of paint) at the same time. Has anyone tried a Polyaspartic coating? I am considering the Spartakote product for my 3 car garage and workshop. The plan is to diamond grind it, then apply a moisture barrier layer, then a base layer, then the chips and finally the clear coat. I am hiring a company to do the work as this is my retirement gift to myself and I want it done correctly and to last at least as long as I do. Any advice would be greatly appreciated. We have an article about polyaspartic coatings here, Buckstops. They are a durable coating that allows for 1 day installation. Spartakote is one of the more well known commercial brands. Is there anything that can be installed over an asphalt floor in a garage? Hello Pat. Providing that the asphalt is fairly smooth and that it doesn’t get hot enough in the summer months to get soft, the only type of flooring that can be installed on top of asphalt would be interlocking tile or garage floor mats. Question, we live in the country, lots of mud sand and gravel end up on my garage floor especially in the winter. I was thinking of coating for looks and making clean up easier but was concerned with the abrasiveness of what’s on our tires possible tearing up the epoxy as soon as I got it coated. Suggestions for country living garage? Hello Darin. You ask a great question. What is important is to choose a commercial quality floor coating system. The single coat DIY epoxy kits from your local home improvement stores will not stand up to such an environment. A quality system will consist of the minimum of a high solids color coat (epoxy or polyurea) and a high performance clear coat. The clear coat protects the color coat and handles abrasion much better. A full flake floor also hides dirt and abrasion better. That said, gravel can take a toll over time by slowly deglossing the clear coat from abrasion. When the time comes, it can be made to look like new again by roughing up the surface and applying another clear coat.